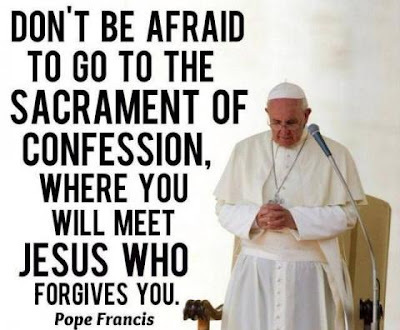 Da Mihi Animas: Pope Francis: What Happens in Heaven When a Sinner Enters a Confessional? Pope Francis: What Happens in Heaven When a Sinner Enters a Confessional? Confessionals are generally quiet, darkened places. But what does heaven look and sound like when a soul enters a confessional? Pope Francis today invited the faithful to think about the rejoicing and celebrating in heaven when a sinner repents. He made this invitation before praying the midday Angelus with those in St. Peter’s Square today, as he reflected on the heart of God as revealed in the three parables from Luke 18 recounted in today’s liturgy. “A common element in these parables is expressed in the verbs that mean rejoice together, make a celebration,” the Pope noted. “Mourning is not spoken of; there is rejoicing, there is celebrating. The shepherd calls his friends and neighbors and says, ‘Rejoice with me because I have found my lost sheep’ (v 6). The woman calls her friends and neighbors, saying, ‘Rejoice with me because I have found the coin that I lost’ (v. 9). And the father says to his other son: ‘now we must celebrate and rejoice, because your brother was dead and has come to life again; he was lost and has been found’ (v. 32). The Pope concluded with a prayer to Our Lady, under the title of Refuge of Sinners, asking that though her intercession, the confidence of the prodigal son might well up in our hearts: “I shall get up and go to my father and I shall say to him, ‘Father, I have sinned against heaven and against you,” the prodigal son said.